Summit considers safety first when conducting any operation. It is ingrained in our approach and execution.Our goal is to have zero injuries. Training and monitoring are the tools we use in striving for our health and safety goals. Our health and safety program is certified through the 'Partners in Injury Reduction' program, an external auditing organization that assess the effectiveness of safety systems. Partners in Injury Reduction is recognized by the Alberta Workers Compensation Board (WCB). Ergonomic injury is the number one WCB claimed injury in the tree planting industry. Summit has designed an Ergonomic Injury Prevention Program focused on significantly reducing this type of injury in our operations. We believe we are leaders in the industry for some of the work we are doing to prevent ergonomic injury. We are currently working with Total Physio in Houston BC, and have developed a preseason fitness and mobility screening tool that all planters can use to ensure that they are in sufficient physical condition to plant for the upcoming season. Communicating awareness at safety meetings throughout the season. Prior to each season, Summit management spends a week conducting in-house training. This training covers company specific procedures and policies. All of our planters are given extensive training at the beginning of the season and refreshers throughout. Summit policies often exceed but always meet government regulations and client requirements. Emergency procedures are posted for every block in every vehicle. Communication to ambulance services and external safety organizations is tested on every block, using either radio communication or satellite phones. 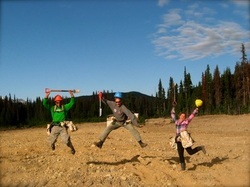 Employees are trained and practiced in block and camp evacuation procedures: Drills and audits are preformed regularly.